Use Prioritise.co to score your daily tasks based on its business, user importances and difficulty level, and receive productivity quotes everyday to boost your motivation to focus on your ONE THING of the day. You can edit, change scores or remove task once it is done with just a few taps. 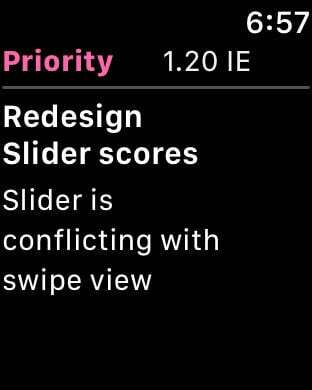 - View priority task on Apple Watch. Keep truck of your priority and don't burn your midnight oil – Download Prioritise.co today! With Get Pro Plan, add unlimited number of tasks. Choose subscription of your choice: bill monthly or annually. Renews automatically and Cancel Anytime.
. Subscription is auto-renewable which means that once purchased it will be auto-renewed every month until you cancel it 24 hours prior to the end of the current period. Duration of the subscription is 1 Month or 1 Year with a charge of $0.99/month and $9.99/year. iTunes Account will be charged for renewal within 24-hours prior to the end of the current period. Manage your Subscription and Auto-Renewal by going to your Account Settings. Any unused portion of a free trial period, if offered, will be forfeited when the user purchases a subscription to that publication, where applicable.